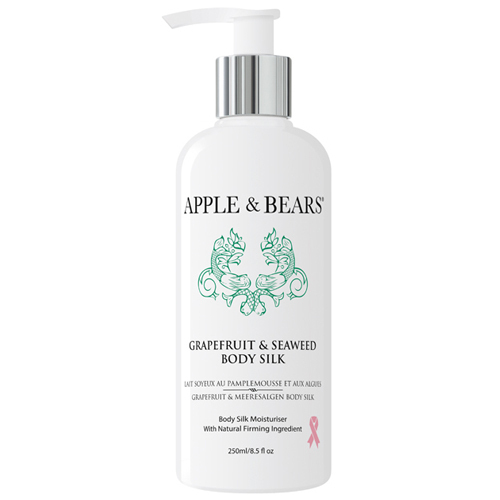 APPLE & BEARS Grapefruit & Seaweed Body Silk contains freshly squeezed Grapefruit and nutrient-rich Seaweed which nourish your skin with a rich blend of minerals and vitamins while refreshing bursts of citrus deliver a deep, long-lasting hydration. Light and non-greasy, our natural active skin firming ingredients gently firms and tightens your skin, while the refreshing aromatic hints of citrus stimulate your senses. Aqua (Water), Aloe Barbadensis Leaf Juice Powder*, Cocamidopropyl Betaine, Lauryl Glucoside, Sodiumcocoamphoacetate, Disodium Lauryl Sulfosuccinate, Coco-Glucoside, Glyceryl Oleate, Sodium Chloride, Decyl Glucoside, Sodium Benzoate, Citric Acid, Potassium Sorbate, Citrus Medica Limonum (Lemon) Peel Oil, Citrus Aurantium Dulcis (Orange) Peel Oil, Citrus Aurantium Bergamia (Bergamot) Leaf Oil, Citrus Aurantifolia (Lime) Peel Oil Distilled, Citrus Grandis (Grapefruit) Peel Oil, Ascophyllum Nodosum Extract*, Fucus Vesiculosus Extract*, Laminaria Digitata Extract*, Elettaria Cardamomum Seed Oil, Salvia Sclarea (Clary) Flower Oil, Zingiber Officinale (Ginger) Root Oil, Myristica Fragrans Fruit Oil (Nutmeg), Camellia Sinensis Leaf Oil, Tocopherol, Hydrogenated Palm Glycerides Citrate, Ascorbic Acid, Limonene, Linalool. Massage in upward circular motions all over your body daily. Below are reviews of APPLE & BEARS Grapefruit & Seaweed Body Silk - 250ml by bodykind customers. If you have tried this product we'd love to hear what you think so please leave a review.